The benefit of incorporating is protection from lawsuits. Statistics have shown that one out of four people are sued each year. In addition a person may experience on average five lawsuits in their lifetime. And one of them is considered crippling. 94% of lawsuits occur in the United States. As a part-time or full time small business owner the best tool you can use to protect your personal assets (home, car, boat, vacation home, etc.) is to incorporate. The #1 benefit for incorporating is personal asset protection. If your business is sued and the lawyer of the plaintiff determines you have been operating as a sole proprietor, all of your assets including personal belongings can be taken away. However, if your business is registered as a legal entity such as a Corporation or Limited Liability Company (LLC) your personal assets will be kept private from the lawsuit. Vice-versa, lets say you get into a small accident in your personal car. You are found at fault. The other person decides to sue you for other damages. They later discover you are the owner of XYZ, Company that generates $500,000 a year in profit. Can your business be taken away because of a small dent in a bumper? The answer depends on how your business is incorporated. If it is a sole-proprietorship the answer is “YES”. If it is registered as a corporation or limited liability company the answer is “NO”. An artificial person or legal entity created by or under authority of the laws or a state or nation, composed, in some rare instances, of a single person and his successors, being the incumbents of a particular office, but ordinarily consisting of an association of numerous individuals, who subsist as a body politic under a special denomination, which is regarded in law as having a personality and existence distinct from that of its several members, and which is by the same authority, vested with the capacity of continuous succession, irrespective of changes in its membership, either in perpetuity or for a limited term of years, and of acting as a unit or single individual in matters relating to the common purpose of the association, within the scope of the powers and authorities conferred upon such bodies by law. Isn’t it worth incorporating the right way just as insurance from loosing everything you have or will create? 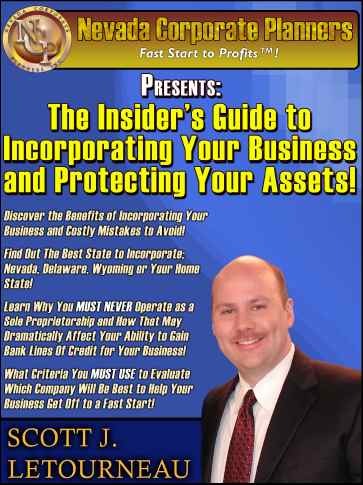 According to Scott Letourneau author of “The Insider’s Guide to Incorporating Your Business and Protecting Your Assets!” a sole proprietorship is 300% more likely to be audited by the IRS than a registered corporation or limited liability company. Why is this? Because the IRS discovered $300 billion in taxes go unpaid annually. 70% of it is from small business owners. 33% of these owners act as sole proprietors. This makes them an easy target for the IRS to collect. Remember the path of least resistance is always taken first. Employee benefits such as health insurance, life insurance, travel and entertainment become deductible expenses. The IRS has guidelines to follow in order to deduct these expenses, but if followed you will save thousands of dollars in taxes. First and last impressions are everything. It’s unfortunate, but how you dress; how you talk, etc. can decide if you succeed. Which introduction leaves a better first time impression? Introduction 1: Hello, this is the owner of XYZ. Do you have a few minutes to talk? Introduction 2: Hello, this is the CEO of XYZ, INC. Do you have a few minutes to talk? CEO and INC give a Fortune 500 impression even though you are a one-member band. Every business will need to raise money to start or expand their operation. After exhausting your family and best friends for money, you will need to ask strangers to help grow your business. The best way to raise capital is through the sale of stock in your company. Investors are more likely to give money when they know your business is incorporated with a legal entity such as a corporation or limited liability company. Why? Because these two entities protect their own personal assets from being taken away if the business is sued. Just like you, investors want to ensure their bottom is protected. You still keep control. You are the one voice and one direction of the company. Lets face it. You and I will eventually perish. But our companies can live forever as long as it is incorporated as a corporation or limited liability company. An owner can transfer shares of stock to a successor through: (1) the sales of stock, (2)employing an individual to operate the business. As a sole proprietor, the business will perish with you at death or severe illness. However, as a corporation the business can easily be transferred or run by another individual. Which in the long run will lead to a tremendous tax savings to your family. If properly structured upon your death probate court could be avoided saving your surviving family money and headaches. Protection from lawsuits is the #1 benefit of incorporating. Incorporating correctly will avoid the embarrassment and pain of a fatal lawsuit. Determine if a Corporation, Limited Liability Company (LLC) or Limited Partnership is best for your business. Get "How to Use Limited Liability Companies & Limited Partnerships" by Garrett Sutton, Esq. Determine the state to incorporate your business. Your home state might not be the best place. An entrepreneur must consider state registration fees, tax rates and laws concerning business entities. Finding the right state for maximum lawsuit protection is fairly easy, because it is Nevada. You can live in any state of the United States and still incorporate in Nevada. Read the 15 benefits of incorporating in Nevada.